Thunder Bay is in the heart of Native American country. Located on the Trans-Canada Highway, it is the western terminus for the St Lawrence Seaway. The seaway is the system of locks, channels and canals that connect the Great Lakes to the Atlantic Ocean. Along with being an important system of waterways for international trade, it's a playground for recreational boating activities. This rugged, northern region is home to the shores of Lake Superior: the largest of North America's Great Lakes, and a popular attraction. Visitors travel to this vast expanse of water to enjoy its striking shoreline, and breath-taking wilderness. Among the highlights are deep chasms, plunging waterfalls and towering granite cliffs carved by the ancient glaciers. 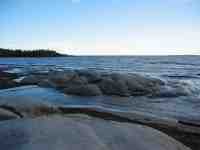 Nature-lovers will relish immersing themselves in Thunder Bay's lakes, rivers and forests.